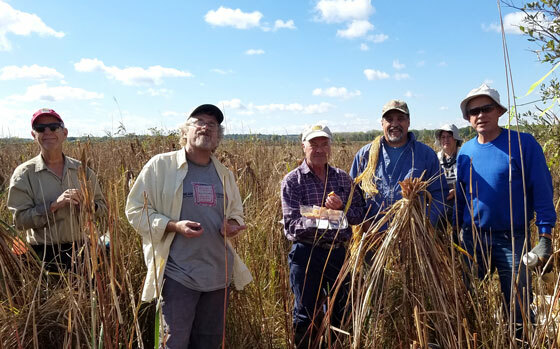 On Sept 29, we celebrated the completion of six years of volunteer efforts to remove invasive phragmites (giant reed grass) from an area of high quality vegetation in the Cherokee Marsh State Natural Area (SNA). We will need to return periodically to remove resprouts, but the first and most time-consuming pass through the area is now complete. We began the project in 2012 at the suggestion of the Wisconsin Department of Natural Resources (DNR)’s newly hired volunteer coordinator, Jared Urban. Stands of phragmites were becoming so dense that the diverse, original native wetland plants were being crowded out. To remove the phragmites, we use the bundle, cut, and treat method. We gather stalks of phragmites into bundles tied waist high with biodegradable sisal twine. Using garden shears, we cut the bundles above the twine and apply herbicide to the exposed tops of the stalks. Volunteer Jim Hughes cuts and treats phragmites in the SNA. We do the work in late summer when the plants are drawing sugars down into their roots and will draw the herbicide down as well. The stalks share a root system so even if we miss a few, the entire colony is affected. This method takes time but has virtually no effect on the surrounding vegetation. Volunteers who apply herbicide have Aquatic pesticide certification from the Wisconsin Department of Agriculture, Trade & Consumer Protection. Since 2012, we’ve removed phragmites from 4 acres of wetlands. That’s 170,000 square feet and over 50,000 bundles tied, cut, and treated! 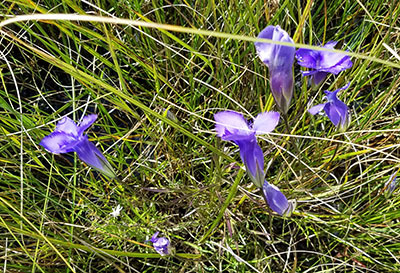 Fringed gentians grow in the Cherokee Marsh fen. 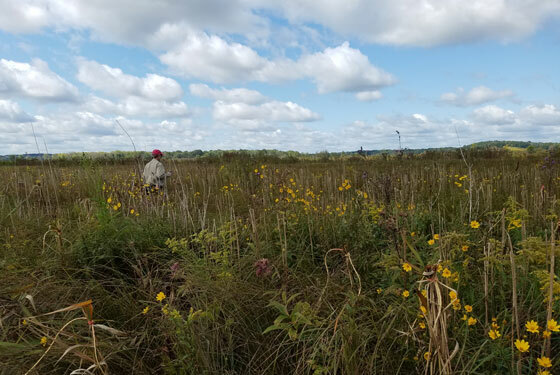 The DNR designated 325 acres of Cherokee Marsh as an SNA because it contains an outstanding example of sedge meadow and fen plant communities. The sedge meadow has tussocks of grass-like, triangular-stemmed sedges and wildflowers such as Joe pye-weed, boneset, and turtlehead. A fen is a type of wetland fed by alkaline ground water and supports flowers such as fringed gentian, white lady’s slipper, and bog goldenrod. The SNA lies east of the Cherokee Marsh Conservation Park North Unit’s trail system and is difficult to access due to lack of public access points, no maintained trails, and the difficult, tussocky and wet terrain. The best way to see the site is to join us on a work day. Or watch for an announcement of a guided tour, which we offer occasionally through the Natural Resources Foundation of Wisconsin. Our heartfelt thanks go to the dozens of volunteers who have participated in this project over the last six years. Special thanks to Jim Hughes and Tim Nelson for leading work days and helping out through the entire six years and to Jared Urban for providing supplies, helpful guidance, and welcome encouragement.